My coffee house worthy No Added Sugar Chai Dark Hot Chocolate combines dark chocolate and and the warming spices of cinnamon, ginger, cloves, cardamom and nutmeg that’s sure to beat winter’s chill. Even though our third Cleveland winter has been quite mild – knock on wood! 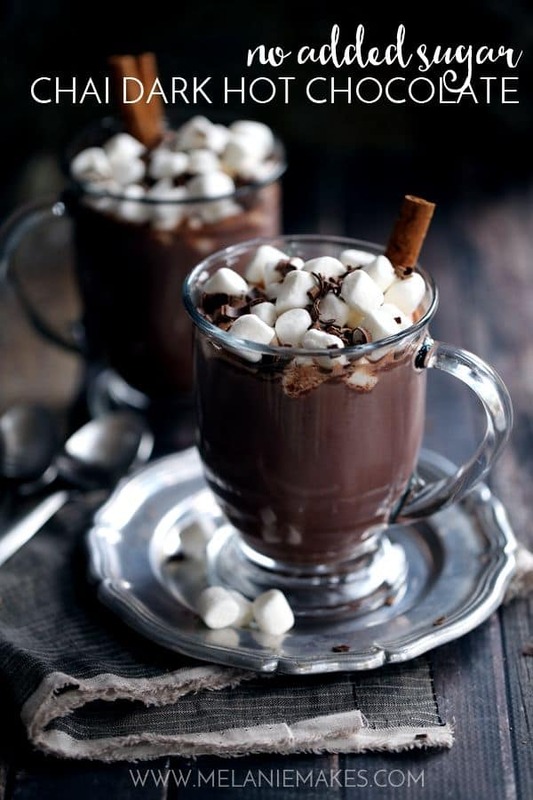 – we still seem to be treating ourselves to hot chocolate frequently. In fact, for the Thanksgiving holiday, I made a hot chocolate bar of sorts so that the girls and my mother-in-law could easily fix themselves a treat. Although I love hot chocolate but I also wanted to shake things up a bit with my own mix that wasn’t so sweet and had a more complex flavor. Enter my No Added Sugar Chai Dark Hot Chocolate, the newest addition to our kitchen’s hot chocolate bar. Forget the packets of powder you mix with water, my hot chocolate is created with a homemade mix and is whisked into milk. Even better? The mix takes less than 10 minutes to create and will make 30 servings of hot chocolate. I’m hoping that will last us awhile! If not, all of the necessary ingredients are already in my pantry so it’s super easy to make another batch when needed. In an effort to make to make our favorite comforting drink less sugar laden, I swapped traditional granulated sugar for SPLENDA® No Calorie Sweetener, Granulated. I love that it was an easy switch that gave my mix the bit of sweetness required, but without all of the calories of sugar. I actually added the SPLENDA® No Calorie Sweetener, Granulated to the bowl of my food processor and processed it into a powder similar to confectioners sugar so that my hot chocolate would be silky smooth. Mission accomplished! 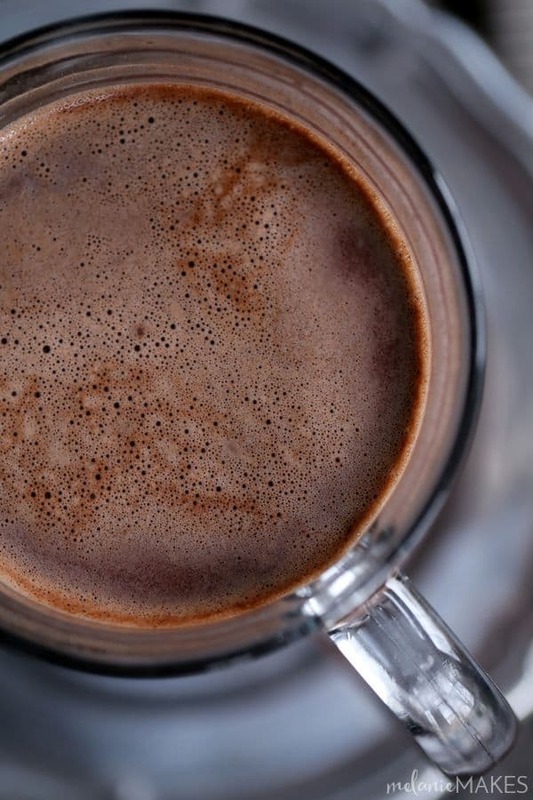 Dark chocolate and the warming spices of cinnamon, ginger, cloves, cardamom and nutmeg combine to create a coffee house worthy version of my No Added Sugar Chai Dark Hot Chocolate. Each serving requires just one tablespoon of my homemade mix which means you’ll have delicious hot chocolate at the ready all winter long! In the bowl of a food processor, add SPLENDA® No Calorie Sweetener, Granulated and process until it forms a smooth powder. Approximately 1 minute. 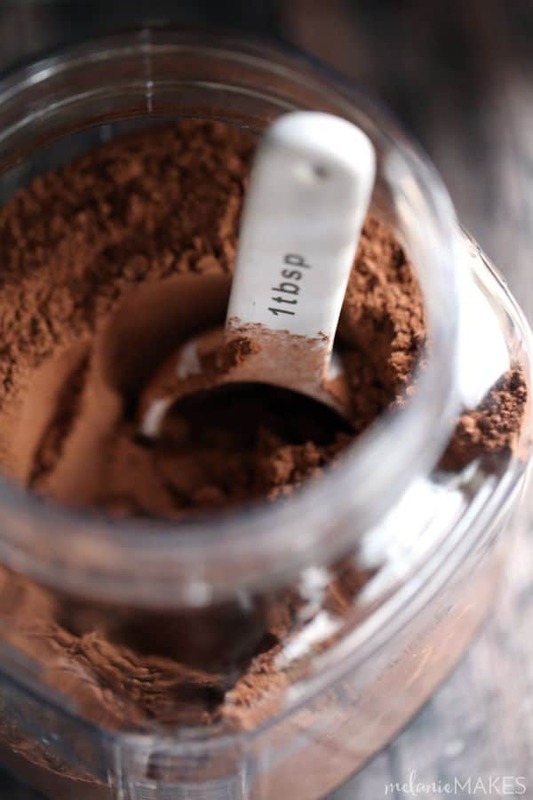 Add all other hot chocolate mix ingredients and process until combined and no large pieces of chocolate remain. In a microwave safe mug, add milk and microwave on HIGH for 1-2 minutes. Whisk in 1 tablespoon of No Sugar Added Chai Dark Hot Chocolate Mix until well combined. Enjoy as is or garnish as desired. 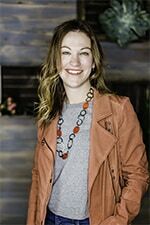 Looking for teacher, neighbor or mailman gifts for the holidays? This mix is perfect! Simply add it to a glass jar and tie a pretty ribbon around it with the easy instructions on how to create a cup and you’re good to go. They’ll thank you every time they find themselves with a steaming mug of No Added Sugar Chai Dark Hot Chocolate in their hand. 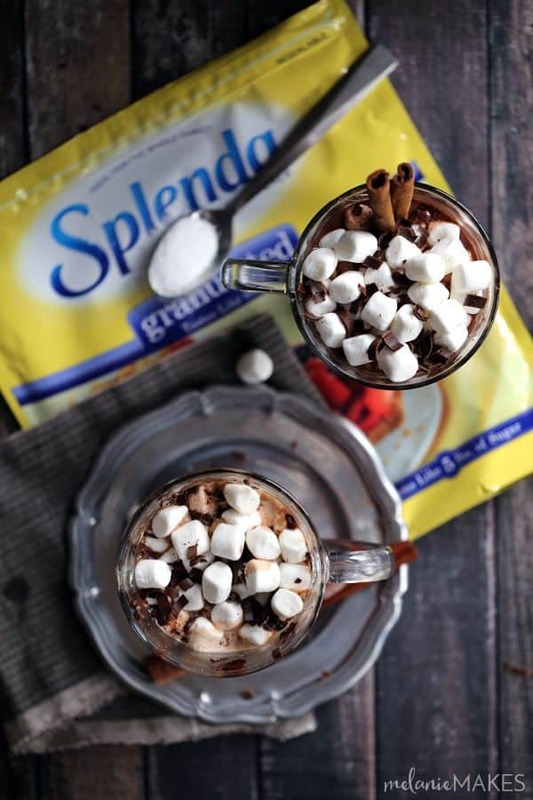 Learn more about SPLENDA® Sweetswaps by following them on their Facebook, Twitter, Instagram, and Pinterest social media channels. This looks very delicious. Is this okay for vegan? If not, do you have idea how can I make this okay for vegan? I want to make some for my friend but she's vegan. Her birthday is coming and I think this is a good gift to give to her. Hope you could help me. Thanks much! Hi, Linda - the mix itself should be vegan. They would simply need to use some type of milk like an almond milk to make it completely vegan. This sounds like a fantastic gift idea!! I can think of a few neighbors that would love this. This looks incredible and I love how you combined the chai with chocolate! This sounds wonderful!! I could definitely go a for a mug of this right now! MMMM! This looks SO dang good girl! I'm craving it! Oh wow! This looks and sounds amazing -- all the spices, seasonings, and, um, chocolate! I grew up in NE Ohio and remember how bitter cold it can be there! I'm in sunny Phoenix now, but still need s great cup of hot chocolate in the winters. Yum! With so many waistline-expanding goodies around this time of year, it's great to see some lower-cal options! 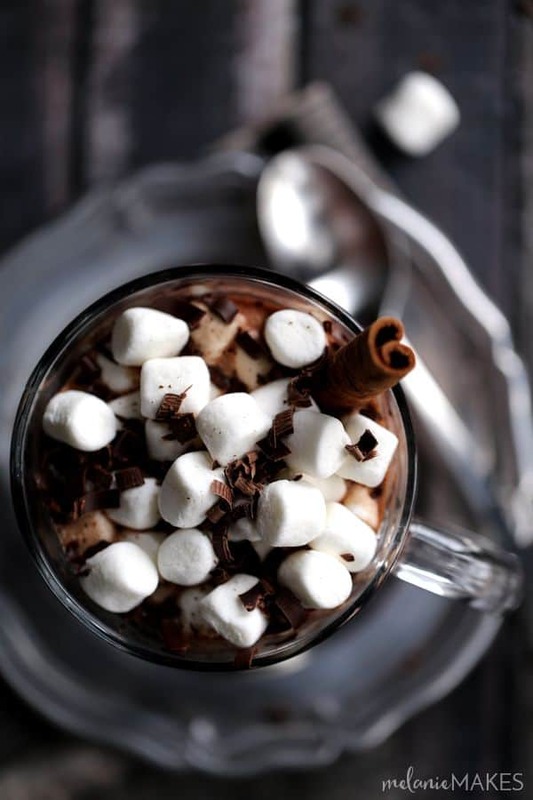 This hot chocolate looks so rich and creamy! Love it! 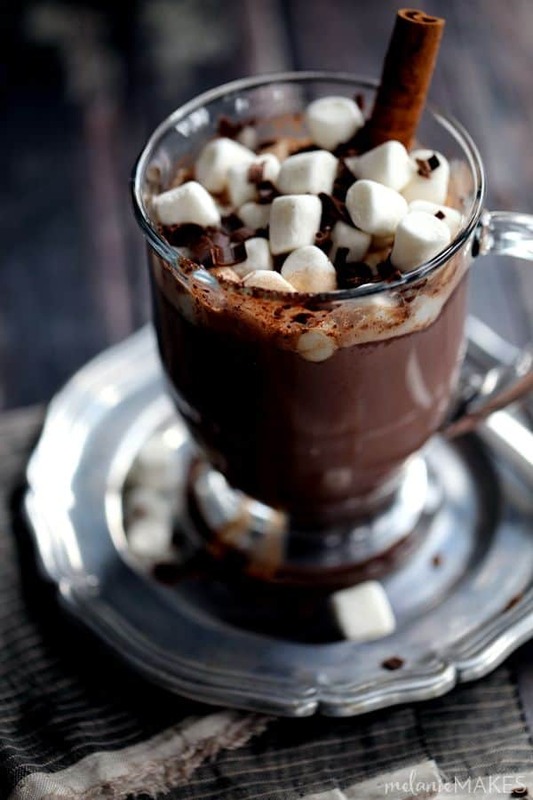 this looks so rich, I want a warm cup right now! Hey, Paula! My bad! I mistyped. I should be a bar of dark chocolate. :) Thanks for catching that - I've edited the recipe to reflect the correct product. Let me know if you give this a try!